Hillary Clinton's presidential campaign on Monday announced the support of almost 90 Texas Democrats, including well over a majority of the Texas Democrats holding elected office in the Texas Legislature and Washington, D.C.
*Editor's note: This story has been updated to reflect comments from Tommy Calvert and Ivy Taylor. The list puts the former secretary of state far ahead of any of her Democratic rivals in Texas when it comes to endorsements. This "Hillary for Texas Leadership Council," expected to grow as the race goes on, will be responsible for recruiting volunteers to help Clinton claim victory in Texas' March 1 primary. The council features eight of the 11 Democrats in the Texas congressional delegation, seven of the 11 Democrats in the Texas Senate and 32 of the 52 Democrats in the Texas House. The list also includes the mayor of the largest city in the state — Annise Parker of Houston — as well as members of the city councils in Austin, Houston and San Antonio, plus elected officials from Bexar, Harris and El Paso counties. In statements, the newly announced endorsers touted Clinton's long relationship with Texas Democrats, which dates back to her voter registration efforts during the 1970s in South Texas. If Clinton were elected president, state Sen. Carlos Uresti said, "Texas will have our priorities and aspirations for the future represented in the White House like never before." Some members of the leadership council had already announced their endorsement of Clinton, such as Travis County Judge Sarah Eckhardt; former state Sen. Leticia Van de Putte, the 2014 Democratic candidate for lieutenant governor, and Wendy Davis, the 2014 Democratic candidate for governor. Others have already campaigned in the early voting states for Clinton, namely Parker and U.S. Rep. Joaquin Castro of San Antonio. 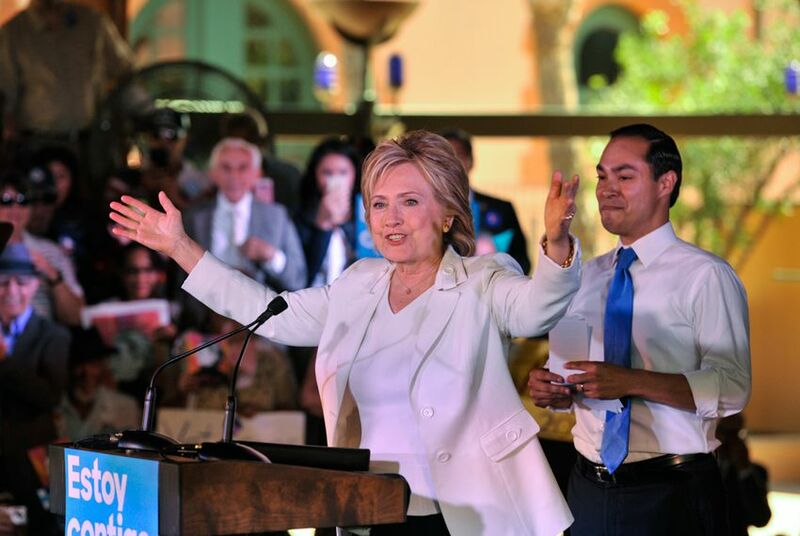 The announcement of the council comes four days after Clinton held her first campaign event in Texas, a San Antonio rally that kicked off a monthslong effort to energize Hispanic voters. At the same event, she received the endorsement of Julián Castro, the former mayor of San Antonio, current U.S. housing secretary and a potential running mate for Clinton. The campaign initially listed San Antonio Mayor Ivy Taylor as a member of the council. Taylor's office then clarified she had not endorsed Clinton and as a nonpartisan elected official does not plan to support a candidate in the 2016 race. "As mayor, Ms. Taylor has had the opportunity to meet recently with Secretary Hillary Clinton as well as Carly Fiorina," Taylor spokeswoman Leslie Ann Garza said in a statement. "The mayor appreciates the service of Secretary Clinton, Ms. Fiorina and all the candidates for President. However, the mayor of San Antonio is a non-partisan elected office, and Mayor Taylor is committed to remaining non-partisan in the upcoming presidential election." Clinton's campaign did not immediately respond to a request for comment on Taylor's statement. Bexar County Commissioner Tommy Calvert also said he was mistakenly included in the endorsements. He spoke at a debate watch party hosted by Clinton supporters last week in San Antonio but said he "told three staffers" he was not endorsing her. "I don't know how there could be any confusion," he added. Disclosure: Judy Trabulsi and Roy Spence have been major donors to The Texas Tribune. A complete list of Texas Tribune donors and sponsors can be viewed here.